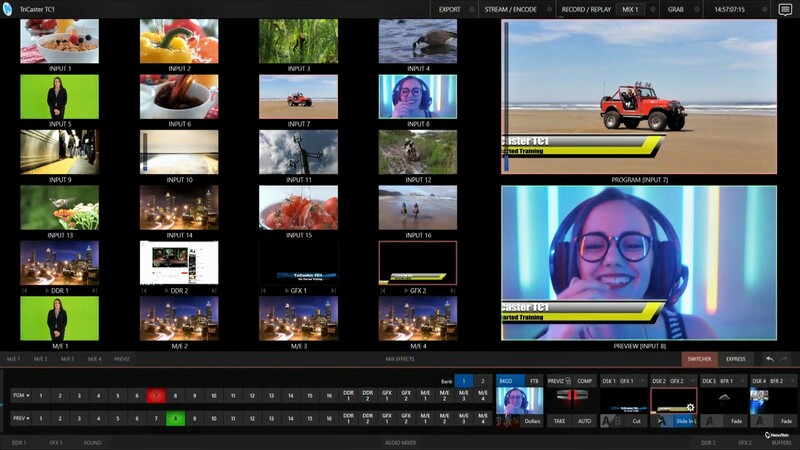 So far we’ve looked at a variety of tasks that are needed to get TriCaster® TC1 ready to begin live production. With this tutorial we’ll dip a toe into how you can switch among video sources, from basic cuts and fades to fancy digital effects, and how you can layer video and graphics using the downstream keyers (DSKs). Trainer Richard Evans steps through the variety of ways that the user can switch between the sources set up on the inputs. The interface is configured as the simple Switcher at the beginning of the tutorial. Most of the real estate is the Multiviewer, with all 16 external inputs, plus four media players (2 DDRs for video clips, 2 GFX for graphic stills and animations), plus the four Mix/Effects buses, plus large monitors for Preview and Program output. 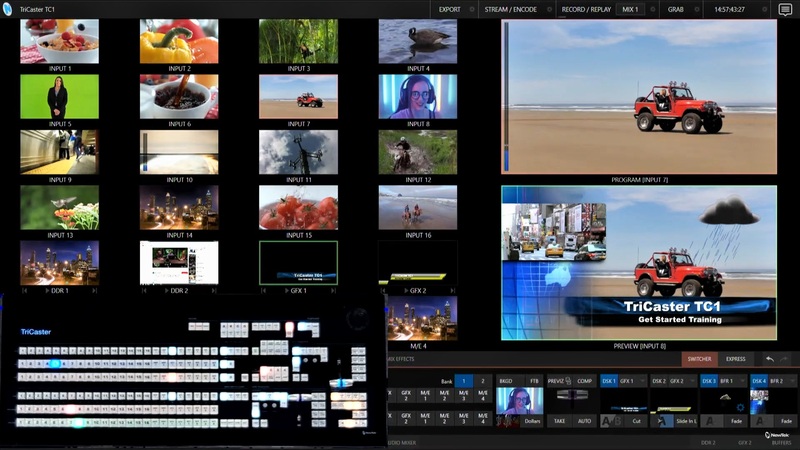 Below the Multiviewer section is a bar of controls that can open up sections of the interface such as the M/E and Pre-viz controls and the toggle between the regular and the Express Switcher controls. Below that are the Switcher controls. There are Program and Preview button rows, the T-Bar and associated buttons, and the Downstream Keyer (DSK) bank and associated buttons. At bottom is another control bar that can toggle open the DDR and GFX bins, audio mixer, etc. Mouse-Click on the source button on the Program row to cut to it. Again, this is not an exhaustive list of even what is seen in the video, let alone the other options for this action in the interface with mouse and keyboard or via touchscreen, and via the control surface. Downstream Keys are similarly versatile to invoke, and you have four of them available to layer video and graphics. And there is a command and macro system available to let you set up a sequence of actions and execute them all at once with a single key or button press. Beyond control via peripherals directly attached to the TriCaster TC1, there is capability for any networked device to be set up to control a TriCaster, via the LivePanel interface. Taken altogether, the TriCaster TC1 offers not just an extensive professional set of live production capabilities, but wraps those in what is intended to be the most adaptable interface and control capabilities in the industry. Whatever your production needs, the TC1 gives you the flexibility to adapt to them and create the most efficient workflow to accomplish your production goals. You can select and assign digital transitions not only to the T-Bar, but also to individual DSKs. Here, a Slide in Left transition is assigned to DSK 2 and triggered, in TriCaster TC1.